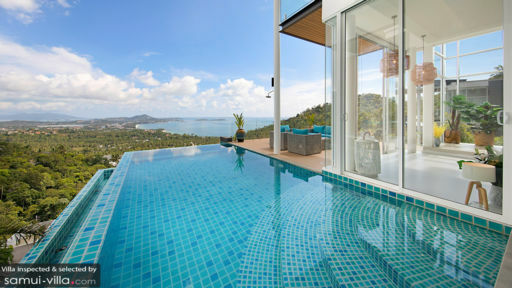 Inspired by European design and rooted to its Thai heritage is the stunning sea-facing Blue Sea Villa overlooking the panoramic view of Chaweng Bay, Koh Samui. A kilometre away from the shores of Chaweng beach, the villa interspersed outdoor magnificence with indoor living. Floor-to-ceiling glass windows and doors, infinity swimming pool with spectacular views, and breathtaking sunsets over the horizon from the outdoor lounge, all make for a wholesome, memorable, and definitive tropical holiday. The three-bedroom villa is ideal for families as well as friends as there are a horde of modern amenities for comfort. Three, well-furnished, air-conditioned, and comfortable bedrooms are located upstairs with adjoining balconies that offer sprawling views of the sea and neighbouring areas. The master bedroom on the second floor is designed with hardwood floors, a king-sized bed, a plush armchair in the corner for a reading nook, and sliding floor-to-ceiling glass doors. Complete with an en-suite bathroom that also provides excellent and scenic views, the master bedroom is luxury redefined. The two guest bedrooms are also located upstairs with plentiful and enviable views of the area. One of the bedrooms has been designed with a king-sized bed while the second has two queen-sized beds perfect for families. Each bedroom has its own en-suite bathroom. Located right on a cliff’s edge, the aqua-tiled infinity swimming pool is a dream come true for most travellers who like to experience beauty unbound. The turquoise waters of the sea, the horizon where the sea meets the sky, and the crown of lush, verdant, and thriving natural foliage create a picture-perfect setting that you will never tire of. 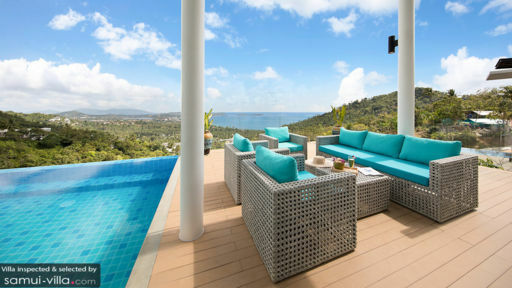 Right beside the swimming pool, you will find the modern outdoor sitting area with rattan sofas and loungers, each offering an excellent view of the bay. A barbecue always sounds like a good idea especially on bright, sunny days. 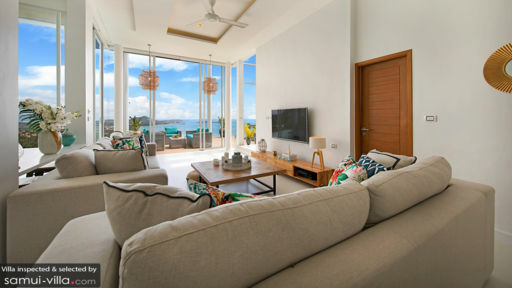 Floor-to-ceiling glass doors lead you inside to the main, air-conditioned living area at Blue Sea Villa which is a lesson in a fusion-inspired living with both Asian and Western influences visible in its décor. The understated whitewashed walls are adorned with stunning artwork, while indoor plants and flowers brighten up the corners. The two, four-seater sofas are uber comfortable to crash on at the end of the day or whenever you fancy. Equipped with a flat-screen TV, you can easily binge watch your favourite TV shows without any interruption. Right adjacent to the living area is a glass-walled games room with a ping-pong table and sweeping views. The villa is fitted with a European kitchen that boasts of state of the art, modern appliances and amenities so you have access to anything and everything when you wish to prepare light snacks, drinks, etc. The chef is all too happy to prepare a delectable and scrumptious meal for you upon request as well. The eight-seater dining table can conveniently accommodate all guests for a feast. Fitted with a variety of modern amenities, the villa is quintessentially a more luxurious tropical experience for the family. It is fully-staffed with security, a personal chef, housekeeping, and maintenance of the pool etc. The best part about living at Blue Sea Villa is its proximity to few of the best sights in town including the famous Chaweng Noi beach; a mere kilometre walk from the villa. There are restaurants, bars, and cafes in the vicinity so you can step out into a more energetic and lively scene. For some additional fun, the Pink Elephant waterpark might be a good way to spend the day.